Latin America (LatAm) is currently Uber’s fastest growing region in the world. And yet, in much of the region apart from Mexico and Brazil, Uber and many of its over 1 million drivers remain unregulated, operating at best without the support of local governments, and at worst in direct opposition to these governments. The company’s success in LatAm is largely due to the fact that Uber’s platform and experience go a long way in addressing a dire regional transportation situation that has existed for decades without lasting or significant change. Despite this unparalleled growth, and the company’s embrace by local populations, Uber’s time in Latin America has been marked by conflict–at times escalating to violence–and uncertainty about its future. How did Latin America become both Uber’s most promising world region and also its most contentious base of operations, and is the current state of affairs sustainable? This article offers an inside look at Uber’s wild ride in Latin America, based on several months I spent in LatAm interviewing Uber’s leaders in the region, drivers, riders, government officials, and more. As mentioned above, LatAm is the fastest growing region for Uber in the world, with more than 25 million monthly active riders, and a presence in over 200 metropolitan areas across 15 countries. It is Uber’s most profitable region, and it is responsible for the highest number of trips worldwide. Uber’s stronghold in Latin America is distinct from its prospects in other high-potential regions like India, The Middle East, and Africa, based on the following factors: LatAm’s geographic and cultural proximity to Uber’s global base in the U.S., similarities in consumer technology preferences between LatAm and the U.S. relative to the other regions, and Uber’s current competitive position in Latin America. The LatAm-U.S. proximity allows for increased support and more efficient scaling. Moreover, as opposed to India and The Middle East & North Africa regions, each of which has an entrenched homegrown player with a substantial presence and market share–Careem and Ola respectively–Uber was the first large-scale mover in the Latin American market, and has maintained a dominant share. Careem’s growth in its home region has made it an attractive potential acquisition target for Uber, and Ola’s position has made it a formidable competitor to Uber in India. In contrast, in Latin America, Uber has managed to scale exponentially while maintaining market dominance. Since launching in Mexico in 2013, Uber has launched steadily throughout the region, including in top markets like Colombia (2013), Brazil, Peru, Chile (all in 2014), Argentina (2016), and many more. Crucially, Uber’s growth in Latin America has also been driven by the region’s dire need for mass change within the transportation space. The impact and growth of Uber in LatAm is so great, because the need for improvement is so great. In short, transportation and mobility in Latin America has decayed to the point that for large portions on the population, there are not reliable and safe transportation options available. In Lima, Peru for example, most of the 10 million people living in the city use “combi” buses to get around–mini buses that are often in decrepit condition, and whose drivers are known to disobey traffic laws. This situation has continued for years, as Peru maintains one of the least regulated transportation legal frameworks in the world. In fact, combi driving is so reckless that there is a popular Peruvian computer game called “Crazy Combi” in which users take on the role of combi drivers and try to avoid traffic accidents. Poor conditions also contribute to the widespread traffic and congestion problem in the region. The quality of both cars and public transport vehicles are just two of the many issues symptomatic of a broader transportation service and safety problem–a problem that is particularly pronounced in the case of taxis. In speaking with Gloria Hutt, the Chilean Minister of Transport and Telecommunications, she noted: “since the taxi market was historically closed (meaning there was limited competition), the service deteriorated progressively over a long period of time.” In Colombia for example, taxi security has been a large-scale issue going back decades. One Colombian transportation company representative I interviewed spoke of a past scam known as viaje de millonario, or millionaire’s ride. This involved a taxi driver driving an unsuspecting passenger a few blocks from their point of departure, at which point thieves got into the taxi and held up the passenger, demanding valuables and digital passwords. More commonly, taxi drivers in meter-less taxis take advantage of riders who don’t know to agree on a price in advance. These types of incidences stem from a lack of vetting of taxi drivers, especially in the case of the many unofficial taxi companies operating in Latin American countries. Uber and other ride-hailing platform companies–companies operating under a digital platform that respond to ride requests through mobile phones–offer an alternative welcomed by locals in desperate need of reliable, affordable, and safe transport (or simply access to any form of transportation in less urban areas). As far as safety, Uber’s platform includes several layers of safety filters and features, including driver background checks, rider verification, 24/7 support, route sharing, and traceability throughout the ride experience. These features simultaneously enable better reliability in terms of understanding who the rider/driver is beforehand, and when and where the ride will start and end. Uber has tailored its product development to further meet specific market needs, whether regional or national. The company recently launched Uber Lite in Latin America, a version of the Uber app geared toward less developed areas that users can download using under 5 MB and that operates using less than 20MB of data. It also introduced its Uber Pool carpooling program in certain cities, and launched Uber Moto (two-wheeled vehicles) in The Dominican Republic given the country’s existing culture of moto taxis. Finally, to combat the large-scale drunk driving problem in Colombia (according to Humberto Pacheco, General Manager for Uber across the Andean, Central American, and Caribbean regions, 10% of accidents in Colombia result from drunk driving), Uber rolled out Uber Angel – a program through which users can request a driver to meet them and drive their car home for them. Beyond these transportation-focused issues, Latin America is home to a number of macro-economic issues such as unemployment or underemployment and income inequality, which make investing in the improvement of transportation infrastructure and service a challenge. Ride-hailing companies provide incremental value on a macro scale specifically in Latin America by addressing these broader issues. These companies create jobs in the notoriously unstable economic region (unemployment consistently hovers around 10% in many Latin American countries such as Argentina and Brazil). Several of the drivers I spoke with began driving for Uber after losing their jobs in the midst of the 2018 economic downturn. In fact, as unemployment rose in Buenos Aires this past year, the amount of new drivers increased dramatically, making Buenos Aires the fastest growing city for Uber in the world. Uber’s legal standing in Latin America is inconsistent with this level of impact. In Latin America, apart from Mexico and Brazil, ride-hailing has yet to be regulated on a national scale. This lack of regulation relegates Uber to a legal no mans land in which its right to operate with the expressed consent of the government is unconfirmed. It also leaves the door open to massive unrest between taxis and ride-hailing companies. I witnessed the effects of this unrest first hand while in the region. Shortly after I arrived and ordered an Uber in my first stop, Buenos Aires, my driver Juan warned me to be careful with taxi drivers because there was a protest against Uber that day blocking certain city streets (a semi-regular occurrence). The more time I spent in Buenos Aires, the more I appreciated the level of animosity between taxis and ride-hailing companies–Uber in particular. As Mariano Otero, General Manager for Uber South Cone (including Argentina, Chile, Uruguay & Paraguay) explained, Uber’s launch in Buenos Aires in 2016 came much later than most other LatAm markets due to restrictive financial regulations imposed by the Argentinian government. By 2016 Uber was well-known and operating under increased scrutiny. Taxi drivers began picketing Uber onboarding sessions even before the launch, and numerous incidents, including bomb threats, occurred according to Otero. The Argentinian government has also repeatedly challenged Uber’s authority, raiding the company’s offices and thwarting the use of local credit cards as payment through the Uber app (cash payment is offered as an option throughout the region, although a credit card is needed to set up the app). Uber driver Martin explained that if he were to be pulled over and identified as driving for Uber, his car could be seized and he would be required to pay a fine of 80,000 pesos (US$2,000). A clear demonstration of the power and value of Uber is that in spite of these obstacles, as mentioned above, Buenos Aires is the fastest growing city for Uber in the world currently, adding 3,000-4,000 new drivers every week. The deterioration in relations between Uber and the government/taxi drivers & their unions in Argentina is particularly intense today relative to other Latin American countries, however its predicament is not unique in the history of Uber in the region. In Mexico and Brazil for instance, the company faced an extreme response from launch through its eventual regulation, including the burning of Uber vehicles and the harming of Uber drivers. Additionally, large protests targeted against Uber have occurred throughout the region over the past several years, from the above countries to Colombia and Chile. The root of the general animosity on the part of the taxi drivers against Uber in Latin America is simple: Uber is taking away their customers and many of their fellow drivers, and is able to undercut standard taxi pricing because Uber does not abide by the same licensing rules or pay the same fees as taxis. Uber considers itself a technology company rather than a transportation company, and its drivers are contracted rather than employed. Uber is separated in this clash from other ride-hailing companies in the region that continue to grow in number. Among its competitors are Cabify, Easy Taxi, and Didi Chuxing, as well as a few country-specific players. While all have invested heavily in the region, Chinese company Didi Chuxing in particular intensified its rivalry with Uber over the past year, acquiring Brazilian ride-hailing company 99 Taxis and building out its operations in Mexico City. What currently sets Uber apart from these competitors is its scale (both number of drivers and global footprint), and the fact that in contrast to companies such as Cabify that register as transportation companies, Uber has always registered as a technology company. Uber has been leading the Latin American ride-hailing transformation, and has consequently been targeted and treated differently than other ride-hailing players. As a result of the tumult surrounding Uber and the lack of ride-hailing regulation, the company and its drivers have needed to adapt to meet the requirements of the region: the company continues to expand aggressively, yet mindful of the tenuous situation, and its drivers continue to operate covertly in many ways. Among the conflict-avoidance strategies I learned about or directly encountered while in LatAm: Uber offices changing locations to avoid run-ins with governments, drivers concocting background stories with passengers about their relationship in case they are pulled over or questioned, drivers consistently insisting riders sit in the front passenger seat, drivers cancelling trips in fear of taxis being nearby, and drivers refusing to drive to the airport in fear of being discovered and fined. Pablo, a driver I rode with to the airport, came up with a surprisingly well-crafted story for the two of us in which I was visiting him as a friend after we had previously worked together in the insurance industry for a particular company. Another time, a driver drove away upon seeing I had a large suitcase with me. The notion of Uber not being able to operate across major Latin American markets like Argentina, Chile, Peru, and Colombia has become increasingly indefensible as Uber’s value has become more apparent. After all, Uber is activating vast amounts of opportunity in Latin America, and the public has welcomed an alternative to the transportation woes of the past. Furthermore, in certain cases, courts have confirmed that Uber and its drivers are not committing any crimes by operating as they are. Despite these rulings, Uber’s legal limbo is far from over. Uber and similar companies will continue to grow. Ultimately it will be up to local governments to mediate and police the so-called taxi wars and carve out clear roles and regulations governing taxis and ride-hailing companies on their own and governing how they interact with one another. As a result, the discourse surrounding Uber and legality has shifted from ‘will ride-hailing be allowed?’ to ‘how will it work?’, focusing on topics like: which safety features the government should request from ride-hailing companies, what kind of insurance the government should require, and in general what contributions the companies in this space need to make. At the end of the day this isn’t a question of Uber, it’s a question of smart cities. It’s a question of progress and development, of how people can really benefit from the changes technology will bring in frameworks that were thought about in a very analog world. One of the hardest notions for governments and taxi unions to understand is that we (Uber) are not competing against taxis, we’re competing against car ownership. For Uber, complementing the existing transportation network is the best outcome. Regulatory frameworks have already been debated and successfully enacted in Mexico and Brazil, and are in various stages of development in the other countries. In Chile for instance, the government approved the creation of a new law surrounding ride-hailing regulation, and the content of the law is under discussion in parliament. Minister Hutt (the Chilean Minister of Transport) reviewed the key points of the proposed law aiming to protect passenger safety and promote fair competition: all passenger transportation operators must establish a local company complying with local tax laws, drivers must obtain professional drivers’ licenses and insurance for passengers, and companies must make available to the Ministry a list of cars and registered drivers to control the requisition of professional drivers’ licenses. 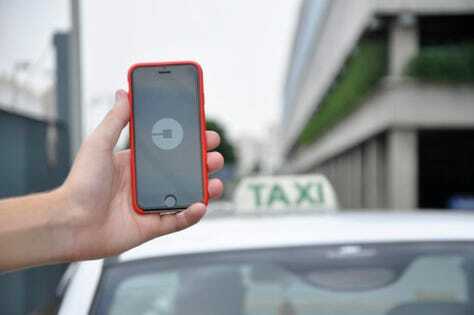 Comparable ride-hailing regulation was recently successfully implemented on a city level in Mendoza, Argentina, calling for drivers to obtain permits and ride-hailing companies to pay annual subscription fees and per-ride taxes. Both Minister Hutt and Natalio Mema (the Secretary of Public Services in Mendoza whom I also had a chance to speak with about the regulation process) encourage other cities/countries without existing regulation to follow suit. The question with this approach is the timeframe with which these types of regulatory changes will take effect, and their openness to incorporate future technological developments. The proposed Chilean law, for instance, has been discussed in congress for over 2 years, not out of the ordinary based on the slow pace of legal change in the region. As Uber’s Mariano Otero called out, although he is confident ride-hailing regulation will eventually be passed either at the city or national level throughout LatAm, by the time the laws are passed there will be additional advances in mobility technology to address, such as autonomous vehicles. Therefore, discourse must be forward-looking, and whatever regulation is passed through partnership between governments, taxi unions, and ride-hailing companies should be open and flexible enough as to leave room for these advancements. Another viable approach is directly addressing the competition between ride-hailing companies and taxi companies by allowing drivers to work for both types of companies as they wish. In Peru for example, and in Mendoza following the new regulations, some taxi drivers also work as Uber drivers using the same vehicle. And as in many other global markets, drivers can affiliate with multiple ride-hailing platforms simultaneously (e.g., Uber, Cabify, East Taxi etc.). This approach effectively frames taxis and ride-hailing companies as complementary rather than competitive. As much as Uber is investing resources to improve its legal standing in LatAm, it is also determined to learn from, and export, much of the business success it has achieved in the region to the other frontier markets mentioned earlier. For example, the company currently has similar active pilots for high capacity vehicles in Mexico and Egypt, and is working with the Japanese government to incorporate public modes of transportation into its app platform. The company’s future vision extends beyond ride-hailing to a multimodal platform model through which users can use the app to find and book not only cars, but also bikes, scooters, and other modes of transportation, and to complete tasks like food ordering and delivery. In this way, the company strives to play an ever-expanding role in the quest to improve mobility and transportation infrastructure, and increase access to this infrastructure in partnership with existing transportation networks. The Latin American market is expected to be a major area of focus for the company to implement and showcase what it’s capable of. Time will tell how much of this future implementation will happen with or without government regulation.